A fantastic new sporting humour series with other titles planned for release over the next year. 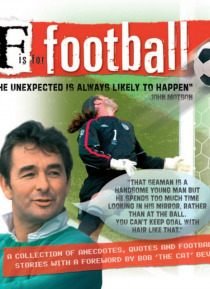 Superb collection of humorous football quotes, stories, anecdotes, jokes and chants, highlighting some of the key characters of the game such as Jose Mourinho, Sir Alex Ferguson, John Motson, Bill Shankly, Brian Clough and many more. Brilliant Gift for any Football fan, this book will make you laugh ou… t loud as you relive some of the greatest quotes that have ever left the lips of your favourite football personalities! Featuring the managers, pundits, players and the man on the terrace, "e;F is for Football"e; is a must for all Football fans.